Offers a new, genetic classification of carbonate porosity that is especially useful in predicting spatial distribution of pore networks. Wayne M. Ahr, PhD, is a professor in the Department of Geology and Geophysics with a joint appointment in the Department of Petroleum Engineering at Texas A&M University. Dr. Ahr has published 150 technical papers and abstracts. He is a Certified Petroleum Geologist and a member of the American Association of Petroleum Geologists, where he serves as Associate Editor. He is also a member of the Society for Sedimentary Geology and the Society of Petrophysicists and Well Log Analysts; is a lifetime member of the Fulbright Association; and serves on the editorial board of the Geological Journal. 1.1 Definition of carbonate reservoirs. 1.2 Finding and developing carbonate reservoirs. 1.2.1 Sources of data on reservoirs. 1.3 Unique attributes of carbonates. 2. Carbonate Reservoir Rock Properties . 2.3 Classification of Carbonate rocks. 2.4 Dependent or Derived Rock Properties. 2.5 Tertiary Rock Properties . 3. 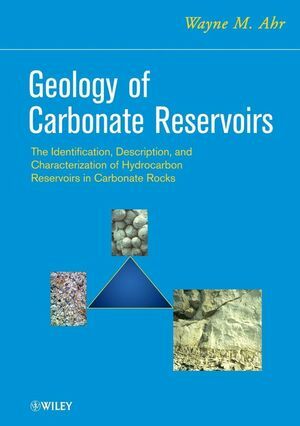 Petrophysical Properties of Carbonate Reservoirs. 3.2 Capillary Pressure and Reservoir Performance. 4.2 Rock, Time, and Time-Rock Units. 4.4 Anatomy of Depositional Units. 5.2 Depositional Environments and Processes. 5.3 Paleotopography and Depositional Facies. 5.4 Diagnosis and Mapping of Depositional Reservoirs. 6.1 Diagenesis and Diagenetic Processes. 6.3 Diagenetic Environments and Facies. 6.5 Porosity enhancement by replacement. 6.6 Diagnosing and Mapping Diagenetic Reservoirs. 7.1 Fractures and Fractured Reservoirs. 7.2 Fracture Permeability, Porosity, and Sw.
7.3 Classification of Fractured Reservoirs. 7.5 Predicting Reservoir Fracture Spacing and Intensity. 7.6 Identifying and Developing Fractured Reservoirs. 8. Summary - Geology of Carbonate Reservoirs. 8.1 Rock Properties and Diagnostic Methods.